I'm Accepted - Now What? Visitors from neighboring states have easy access to AAC’s Ozark Campus via major highways throughout Alabama. Located on US Highway 231, the Ozark AAC Campus is a local landmark and easily found. With various restaurants and motels providing excellent accommodations nearby, visitors touring the campus are assured of a pleasant stay in Ozark. 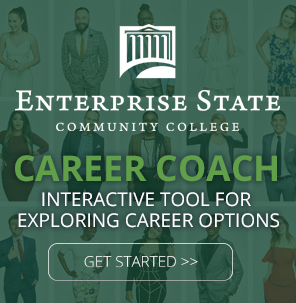 Enterprise State Community College offers excellent academic, technical, and workforce training programs in order to prepare students for jobs that are in demand! Our faculty and staff are committed to the educational success of all ESCC students! I’m Accepted – Now What?